Pro PR Tips in person! I’ll be on a fun panel with a bunch social media wonks tonight, January 19, run by the Social Media Club, about social media (surprise) and public relations. I’ll be signing copies of my book, Pro PR Tips, at the event. Co-panelist Brian Solis will also be there signing his book, Putting the Public Back in Public Relations. I was interviewed for episode 100 of the Hack and the Flack podcast. Listen now. It’s a book! And it’s free! Tech PR pros: Click to reserve your free copy! I’m delighted to announce that the Pro PR Tips book is now available through my sponsor, ITDatabase. That company, which makes a directory and tracking service of writers and topics for PR people, is giving away the book to qualified people in the tech PR industry. If you’d like to get on the list to receive the book, sign up here. Big thanks to ITDatabase for making it possible for me to realize my dream of turning this blog into a book. Also thanks to all the people who have contributed to this project. It has been, and continues to be, really fun. Also: See Pro PR Tips in the New York Times: Spinning the Web: P.R. in Silicon Valley. I just ran Pro PR Tip #75. I plan to post daily tips up to #100. Then we’ll see. 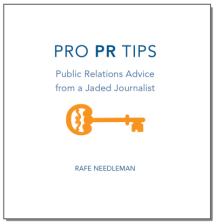 Anyone want to sponsor a Pro PR Tips book of all 100? My old buddy Sam Whitmore of Sam Whitmore’s Media Survey interviewed me about Pro PR Tips. Click to listen to the 6-minute interview. Update, Apri 22, 2013: Unfortunately, this interview is offline and there is no archive. Sorry!